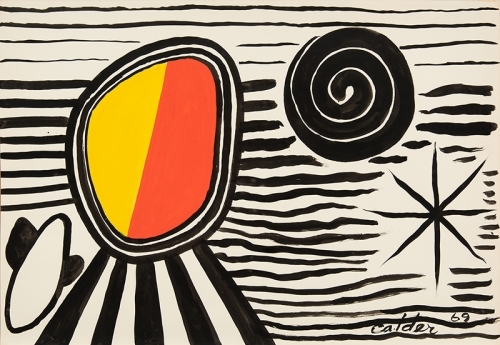 New York—July 30, 2018—In September, Hollis Taggart will inaugurate its new street-level gallery at 521 W. 26th Street, with an exhibition of significant recent acquisitions, including works by Alexander Calder, Adolph Gottlieb, Hans Hofmann, and Theodoros Stamos. The gallery will concurrently open a private viewing and storage annex across the street, with visits available by appointment. This consolidates the gallery’s operations in Chelsea, where it first moved in 2015. Together, the spaces provide Hollis Taggart with nearly 4,000-square-feet to host exhibitions and engage clients with select works of art in its inventory. The inaugural exhibition, which will open to the public on September 6, will be followed by an exhibition of mid-career and emerging artists, organized by independent curator Paul Efstathiou, in October, and a solo exhibition of works by acclaimed Pop artist Idelle Weber in November. To inaugurate its new space, Hollis Taggart will present a selection of acquisitions made over the last six months that exemplify its collection strengths in Post-War American art. Among the standout works are: Untitled (1969) by Alexander Calder, a work on paper that captures the artist’s fluid and spontaneous lines and references the cosmological themes that inspired many of his sculptures and mobiles; The Tea Kettle (1952) by Hans Hofmann, an oil painting that epitomizes Hofmann’s deep engagement with color as a means of creating light and movement on the canvas; and Untitled (July 3, 1965) by Adolph Gottlieb, which serves as a compelling example of the artist’s iconic visual lexicon and uncanny ability to convey emotion through abstract compositions. The exhibition will feature approximately twenty significant works by artists that have become synonymous with the Post-War era. In his second collaboration with Hollis Taggart, independent curator Paul Efstathiou brings together the work of thirteen mid-career and emerging artists in a celebration of the diversity and innovation of contemporary practice. Among the featured artists are: William Buchina, whose acrylic and ink paintings combine and interpret imagery from disparate sources to create new narratives and commentaries; Brenda Goodman, whose abstract forms and figures are connected by her ongoing experimentation with and singular use of material, surface, texture, and color; and Marcel Dzama, whose ink and watercolor works are characterized by a sense of whimsy and fantasy that recalls Surrealist and Outsider Art movements. The selected artists highlight a spectrum of visions, processes, and approaches, and, together, provide a rich and compelling aesthetic experience for visitors. Idelle Weber’s work challenges mainstream perceptions of the culture of the 1950s, ‘60s, and ‘70s through paintings, prints, and works produced on laminated plastic forms. Working within the Pop Art idiom, Weber carved a distinct space for herself through the use of a hard-edged silhouettes of figures that she positioned atop a variety of colored, patterned, and otherwise designed backgrounds. Although clearly situated within the period in which they were created, the anonymous nature of the silhouettes and graphic quality of the works transcend time, making them feel unexpectedly contemporary. Following a presentation of Weber’s work in 2013, Hollis Taggart returns with an exhibition that further explores Weber’s wide-ranging and dynamic body of work. Founded in 1979, Hollis Taggart—formerly known as Hollis Taggart Galleries—presents significant works of American art, showcasing the trajectory of American art movements from the Hudson River School to American Modernism and Post-War and Contemporary eras. Its program is characterized by a deep commitment to scholarship and bringing to the fore the work of under-recognized artists. It has sponsored several catalogue raisonné projects, most recently for Surrealist artist Kay Sage, and has been instrumental in advancing knowledge of such compelling artists as Alfred Maurer, Arthur B. Carles, and more recently, Theodoros Stamos, Marjorie Strider, and Michael (Corinne) West. In summer 2015, the gallery moved its primary location from the Upper East Side to Chelsea. In fall 2018, it will open a newly renovated street-level location on W. 26th Street, as well as private viewing and storage annex across the street. With 40 years of experience, Hollis Taggart is widely recognized by collectors and curators for its leadership, expertise, and openness, on both matters of art history and market trends and opportunities. For more information about Hollis Taggart and our upcoming exhibitions, please contact us at info@hollistaggart.com or 212.628.4000. For press inquiries, please contact Alina Sumajin or Sascha Freudenheim, PAVE Communications & Consulting at alina@paveconsult.com, 646.369.2050 or sascha@paveconsult.com, 917.544.6057.